STSci-2005-12a - New pictures from the Hubble telescope are giving astronomers a detailed view of the Whirlpool galaxy's spiral arms and dust clouds, which are the birth sites of massive and luminous stars. This galaxy, also called M51 or NGC 5194, is having a close encounter with a nearby companion galaxy, NGC 5195, just off the upper edge of this image. 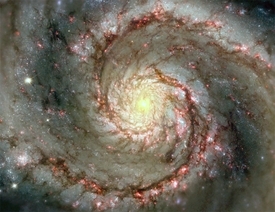 The companion's gravitational influence is triggering star formation in the Whirlpool, as seen by the numerous clusters of bright, young stars [highlighted in red].